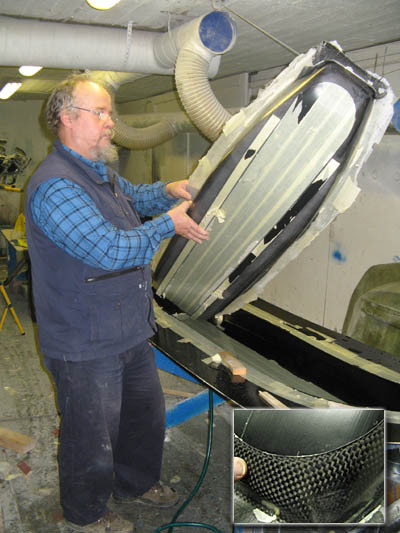 Pekka Tyllilä made his first touring sledge in 1978 and in 1981 he started to study how composite technology would work with sledges. As a results of this study, his first composite sledge came out in 1985. This was just a hobby for him then. Hiking Travel, Hit LP was founded in 1992/1993 by Liisa and Pekka Tyllilä. The nature tourism company arranges different kinds of tours and programs for groups and individuals. The business started to be more and more professional. Soon it was discovered that a workshop would be needed, at least for repairing and maintaining equipment. Soon a a workshop was put up where they could also build their own outdoor sports equipment. The first product was a canoe, which was designed for 6 persons (C6 Teno 2000). It’s still the only big canoe model produced in Scandinavia. The maiden voyage with the C6 canoe was made on 10.6.2000 and the first sold product was delivered to a customer in the end of summer 2001. Soon they realized that their product family should be wider. They decided to take advantage of Pekkas knowledge of composite materials and started to make sledges. Their first sledge was the Small Hit, holding 200 l of equipments. The first mold was built in the winter of 2003. At the same time Hiking Travel, Hit LP decided to take part in the Plastic Technology in Pirkanmaa development project (MUPI). Only after one year the first tests in vacuuming technology were taken. A polyurethane inner mold was build for repeated vacuuming, whereas the outer mold was made with normal composite technology. In these days Pekka Tyllilä and Pete Mäkelä met each other. Pete Mäkelä was interested in developing a high-class Finnish sledge especially for arctic expeditions. Only after a few weeks of thinking, they started to design a bigger sledge. Pete Mäkelä wanted the sledge to have a new and improved nose structure. It was quite high and slim compared to other sledges. Other manufacturers have copied this structure more or less after that. The new model was called the Big Hit, and it came out in 2004. It was bigger and wider than the first one, holding 450 l of equipment. At the same time the MUPI project started to investigate a possibility to attach textile surface polyethylene sheets to fibreglass. The idea for this came from Antti-Jussi Tiitola. The structure is similar as used in racing skis. The first Big Hit with a polyethylene surface came out in 2004. The polyethylene was attached between the sledges skis. This model took part in the Erä magazine sledge test in 2004/2005. Its gliding capabilities did not show that much in that test because the most important gliding surface, the skis were still normal polyethylene. In the winter of 2005 there was not much time for development. A lot of mistakes were made, for example there were problems with the polyurethane vacuuming mold. Still, probably the first sledge in the world with textile surface polyethylene sheets was made. The sheets were attached with vacuum injection technology. The test was almost a total catastrophy, but after a lot of fixing, they managed to built a structurally acceptable sledge. Even though the first model didn’t look so good it was bought. After all these years, the buyer is still very satisfied with the sledge. Ski base polyethylene glides really good. In the fall of 2005 and the winter of 2006 there was a new technology under testing. New vacuuming sacks were made from silicone which were produced by Hit itself. This technology made it possible to built a sledge in a way where composite structure was fully integrated in the building stage. The polyethylene skis or undercoating did not need to be glued or riveted afterwards anymore. Still there were some problems with the vacuuming sacks and new outer molds. Afterwards the view was that even experts from the composite industry did not have enough knowlegde for this kind of technology. The biggest leap for progress was made in 2006, when Pete Mäkeläs expedition team had their Fjellpulken sledges fitted afterwards with the same polyethylene undercoating for the Svalbard 2006 adventure in Spitzbergen. The first expedition member to do this was Jari Kaaja. The others followed soon after. All the sledges on this adventure were fitted with polyethylene undercoating. They all were very pleased with the new technology. As a result of this, it was now easy to arrange a comparative test. A sledge from a well known manufacturer with and without polyethylene undercoating was now set to the test. Already the first minor tests showed positive results. The version with the polyethylene undercoating showed an average of 25% improvement in gliding properties compared to the regular one. Tests were made on a hard snow base with a little loose snow on top, so the circumstances were quite similar than those in arctic areas. It’s obvious that polyethylene undercoating helps more in flat ground with hard snow. But it’s still very useful in other circumstances also. Even a small group on tour can take advantage of it: the first skier will make the snow a bit harder, the following will not sink but will glide better. Installing polyethylene undercoating afterwards the visions of such sledge shapes, which will support undercoating and therefore support gliding cababilities started to develope. In the winter of 2005-2006 Retkilehti, the leading outdoor magazine in Finland had a sledge test and all known brands were in it. Hiking Travel, Hit gave their new version of the Small Hit to the test. There was as much ski base polyethylene as possible in the surface. It was a success right from the beginning. It was dramatically the best glider in the test and would have been best in whole, if a little bit more empasis had been put on the gliding capabilities. To this it can be said that the gliding capabilities, when having a heavy load is much more important than other factors, at least in extreme conditions. Sometimes this can mean that when the sledge is fully loaded, a man can not pull it without the help of the undercoating. Now this technology had been tested two times and undoubtedly showed that its gliding capabilities were much better than in conventional sledges. Following Pete Mäkelä wanted to have a giant size sledge, for the arctic adventure to Greenland in 2008 with Petri Vuorenmaa. The sledge would have to be even bigger and stronger for this expedition. Development started in the end of 2006. Now, after these years of trial and testing we knew how to build a sledge using vacuum injection with all parts fully integrated in the manufacturing process. As much polyethylene undercoating as possible was put in the surface to maximize gliding capabilities and to minimize friction. Combined with a higher and more gently sloping nose structure, this makes the sledge good for different kinds of snowtypes. The new version was based on the Big Hit shape and it is 700 l in volume. New materials and technology were used in this prototype. 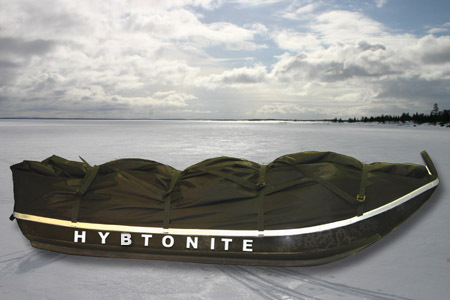 The first polyester/glass/polyethylene versions were built for a test tour on the Lake Inarijärvi in Lapland in 2007. The sledge managed it very well. The test circumstances were very hard: the sledge was pulled on a billowy lake surface snowfields with 10 times faster speeds than normally, using a sail kite. The development of this new bigger version did not stop at that. Five sledges were made, from which two were chosen to the Greenland expedition. The new construction was epoxy/carbon/fiberglass and ski base polyethylene. Changing the resine from polyester to epoxy, the sledges sharp edges become stonger and the fibers are working better otherwise as well. The possibility that the composite structure fails in the corner of the ski under the undercoating from the result of hard hits is reduced dramatically. Also the possibility of a point type of hit piercing the structure is unlikely. There is a lot of comparative material to show. All modern skis are made using epoxy and a certain type of plastic designed for undercoating. When using carbon instead of glass, it is possible to lose weight without weakening the structure. For example where the lightest Small Hit hull weight was 5 kg one year ago, now it’s only 2,7 kg. Development goes further also in basic models. Now there is a new version of the Big Hit in development stage, which will be covered with as much polyethylene plastic as possible, as the HIT Ultima Thule. Because of the Greenland project, totally new materials and technology, Hiking Travel, HIT has now 9 different models and several different technologies for their sledges. It’s been 5 years of innovation.